I wrote a blog post back in October, Show Folded Cards – Great feature implemented differently, where I looked at PokerStars and Full Tilt and how differently they had implemented their Show Folded Cards feature. Today when I played on Full Tilt I noticed that they had changed their implementation. 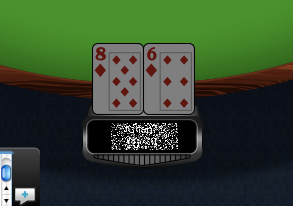 Now it works like it should, showing the player his cards when he moves the mouse over his position. Good job Full Tilt! As I wrote back in October, it isn’t always enough to have all the functionality, you also need to make good implementations of them!